The German Packaging Act stipulates that manufacturers and distributors are obliged to license all sales packaging and repackaging, which are typically generated by private end users and equivalent sources of waste generation, in a dual system and ensure that they are taken back and recycled in due and proper form. BELLANDDual is recognised throughout Germany by the responsible authorities in accordance with the German Packaging Act and organises separated collection of used sales packaging close to households across the board. 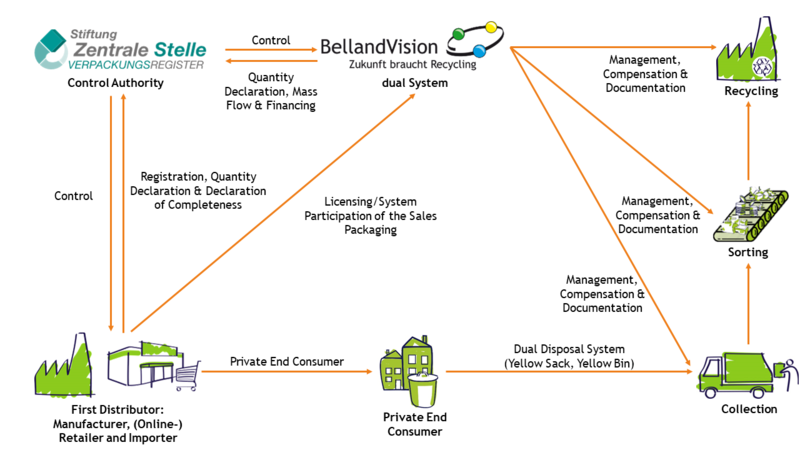 BellandVision ensures that taken-back packaging is recovered in an environmentally-friendly way, documents the process as required by the legislative authority and creates an annual mass flow balance checked by an expert in accordance with the German Packaging Act. Approx. 4,500 contract partner from industry and trade using the convenient range of services of BELLANDDual with complete satisfaction. See these benefits for yourself!